We will be participating in Casual Day this year. We appeal to you to please contact businesses / schools in your area and try promote and sell Casual Day stickers. Casual Day falls on the 1 SEPTEMBER 2017. Please contact Lilian to obtain the stickers. 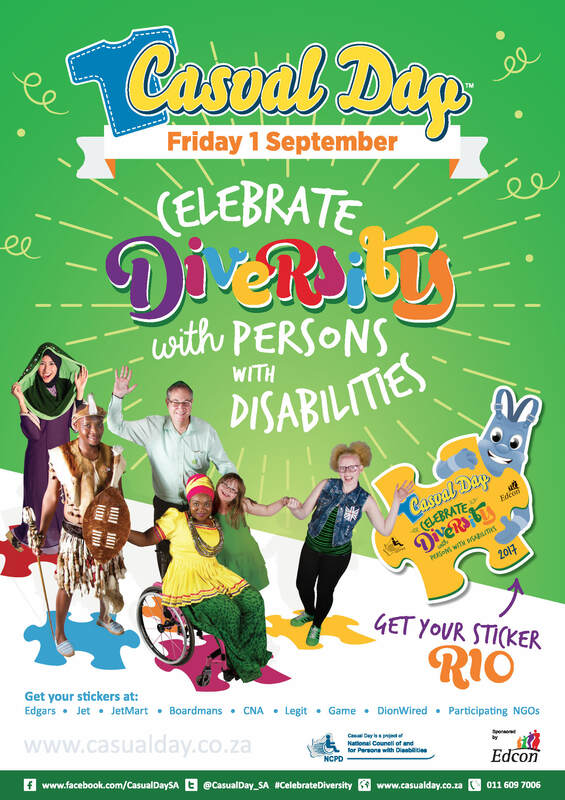 The theme this year is “Celebrate Diversity”. Please don’t forget that we are collecting White Elephant, books, CD’s, DVD’s etc. for our Fete. Date still to be announced. SASSA came to do Life Certificates with all our Residents. Fire Alert has finished installing the smoke detectors throughout the Home. I am just waiting for the Certificate to be issued so I can submit it to our insurance company. Round Table #2 came through with a substantial donation so the two projects will be started shortly. Our swimming pool had a few cracks in the fibreglass. Pool Magic have completed the repairs. Three geysers burst and one geyser has had to have a new thermostat fitted. Two fat traps have been fitted. One in the kitchen and the other in the staff dining room. This is cleaned once a week. This will stop the blockages happening. Two extra cameras were installed and a monitor and computer have been put in the Duty room so that the Sisters can have access to the footage. The monthly Birthday party was held for Bonita (31) and Trent (16). Bonita’s sister organised a cake for her birthday and Sagri organised a poster and balloons. Trent’s dad organised a cake for his birthday. Some Residents enjoyed an outing to the Butterfly Farm. This was thoroughly enjoyed. Our new Resident, Naquita Cardona, has settled well into the Home. Lilian and Meryl took her to Home Affairs to apply for her ID card. This was ready a week later. We can now apply for her SASSA card. We welcome her parents, Steven and Julie, to the JPH family. Dr Soni came to the Home to see Naquita and Sbu to do their medical report for SASSA. Now we wait for SASSA to come and do finger prints and photos. Cordwalles Boys Choir and Instrumentalist sang songs for the Residents. The ambulance was called for one of our Residents who fell at bath time. She was admitted to hospital and it has been established that she had suffered a stroke. Dr Kirkby came on a weekly basis to see and treat Residents. An optometrist came to the Home. Some of our Residents and staff had their eyes tested. Natasha did the First Aid Level 1 course on the 7th & 8th June. Karin attended the Mental Health Forum at Townhill but it was cancelled due to no quorum. The next meeting will be held in August. Daphne went on a weeks’ leave. Milly was sick on the 23rd – 25th June. Karin relieved for her over the weekend. Louise goes on leave from the 26 June – 23 July. Natasha will be relieving for her on night duty.